I love beer, I love food, I love beer and food together but I don't write about them enough. I'm always testing out new recipes at home, experimenting with flavours, trying different beers with different foods but rarely does anything make it onto these virtual pages. Take this as a statement of intent then, an intention to blog more about the cooking I do, the dishes I make and the beers I eat them with. Flat breads are something I make a lot. Sometimes because they're quick and easy, always because they're delicious, more often than not because there isn't any fresh bread in the flat. My method involves flavouring flour with things that take my fancy: dried herbs, fresh herbs, garlic, spices, tomato puree etc and then combining it with enough water to make a dough. You then roll out 3mm (ish) thick circles and drop them into a dry, heavy-bottomed frying pan. Leave for 2 minutes, turn, leave for 2 minutes, done. Easy as that. 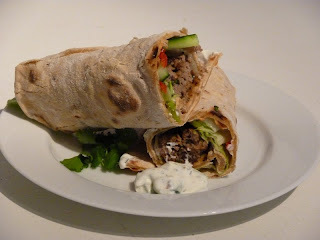 Koftes are a favourite filling for flat breads. Although traditionally made with Lamb; I prefer to use minced beef and it works just as well. Take your beef mince and add roughly one egg yolk per 250g, fresh coriander, salt, pepper and/or whatever you decide might be good. Mix thoroughly and then, with your hands, form sausage shapes around metal Kebab skewers. Cook on a hot griddle pan with quarter turns every few minutes. Stuff your flat bread with the meat, shredded red cabbage, cucumber, some finely sliced chili and a generous drizzle of yoghurt or soured cream. Delicious. Mark Dredge places his stake firmly in camp Mythos, but what beer would you pair with this? I never knew flatbreads were so easy to make! I must make them. I do love any variation on meat in bread - you could write a book on the variety and put a local beer with each. Not sure exactly what I'd pair with this one... Maybe a milk stout for a left-field choice (roasty, good with spice, slight lactic to go with the yogurt), maybe a best bitter with plenty of earthy, spicy hops. Outside, doing this on a BBQ, then it's a cold lager in one hand and food in the other - simple and delicious!